I am well. Warm, sticky, well and in Moab; a most striking and apparently hidden treasure on earth. It is adventure nut central and tomorrow I will bail after my brief interlude with rock climbing. I may just be hooked for it is a bit crazy good, but that is enough for the time being. 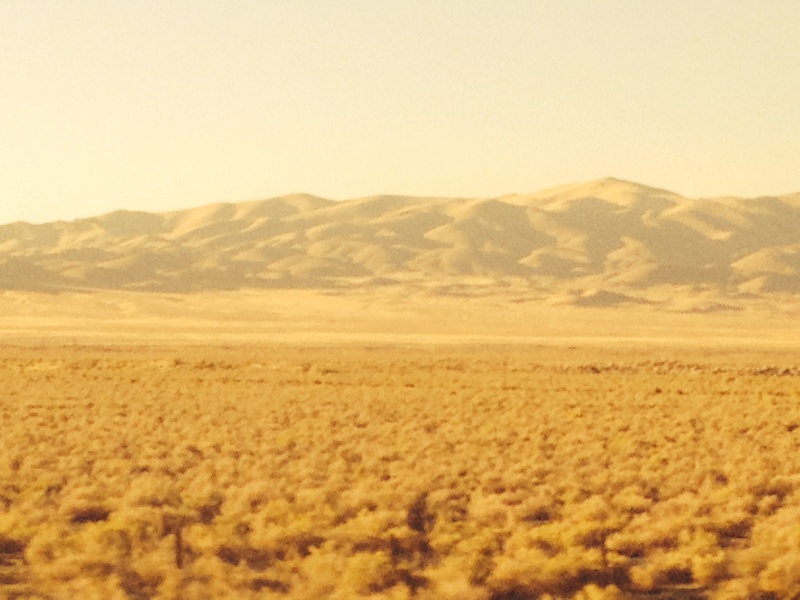 When I boarded the train in Reno there were two conductors hanging about; one scanned our papers while the other told us how to behave. The good manners lesson went on and on and on. For at least ten minutes, which is long, especially considering the train was stationed waiting for us to be schooled. “I don’t catch all o’ you smokers all o’ the time, but I do catch a great big percentage of yer.” Shoes must remain on at all times, we weren’t to take on any troublemakers ourselves…and so it went. It was and indeed remains a little worriesome to be told how to behave on a train but perhaps it was a Reno thing because the joint was so chock full of ‘burners’ and perhaps they thought there’d be strife, but I have this funny feeling that this is not a Reno thing. I really hope I am wrong. The day before my departure I went hunting for some flowers “you want fresh flowers?? ?” and came up with an azalea for Jan and Stan to plant. It is a more pushy present than I’d hoped to give them but it was that or floral plastic and I remind myself that it is not a puppy and that Jan and Stan have a good sized yard. And at the supermarket check-out my coins were not handed to me but spat out of a machine instead. Odd. Germs or efficiency I wonder. And there was a bloke outside the store busting out moves while listening to his yellow Sony walkman. Oh the cassette tape. Oh the good old times. 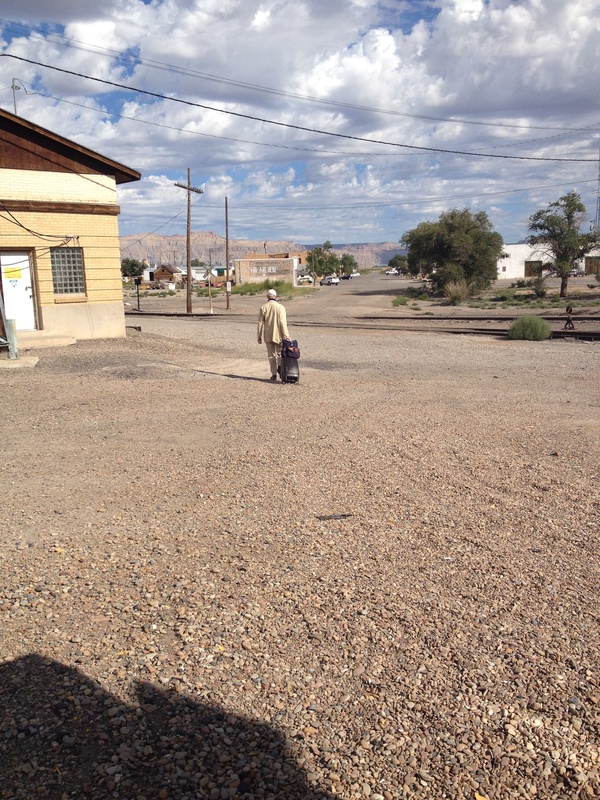 I got off the train in Green River. 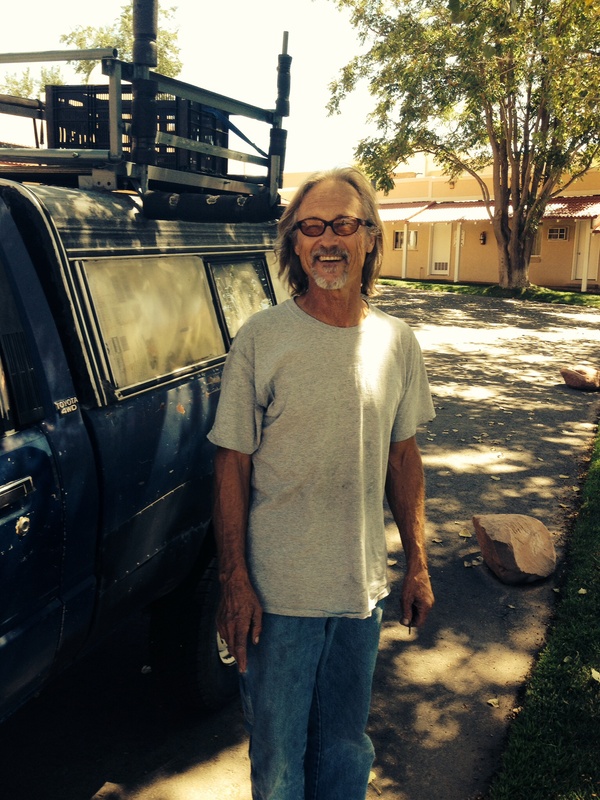 Green River Station to Moab was a mini mission but, with the help of my new mate Gino the Roman, it was pulled off with fortunate ease. I caught a whiff of the challenge earlier on when chatting up a conductor on one of the breaks for the smokers who, by the looks and the grumbles of them, must have been sitting on that Amtrak voyage desperate for decades. “So, you got someone collecting you at Green River?” he wonders. I had lashed out and got a sleeper for the 17 hour journey and the carriage steward whispered that the chap in number 10 was also alighting at Green River. Enter Gino. Gino is a charming Roman, ex financier, ex advisor to Italian governments, son of a film producer turned film producer himself, snooker shark (we held off playing when I told him I was a bit ‘hit and miss’), a husband who just got sprung cheating on his missus, and a man with even less clue about Green River than I. “I might stay a couple of nights” he says before we had even pulled in. I told him I would do all I could to avoid such a situation. We looked to be in strife in Utah. We were the only two getting off the train (they all knew), and there was not even a chair on the platform let alone a loo. The sticks. We shared pancakes I had grabbed as take away (I bullied him into trialling bacon and syrup) and headed for Main Street. 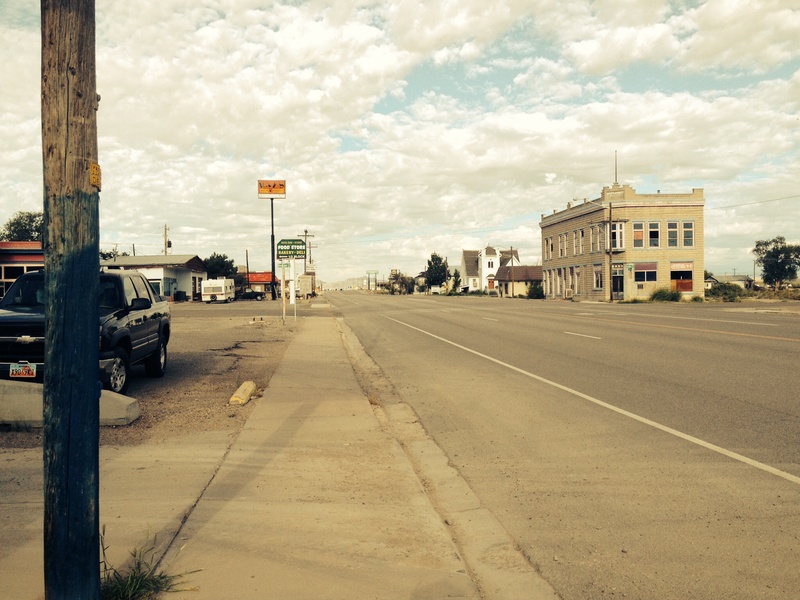 Green River was once a mining centre, a Wild West film location, and a missile base. Green River is now one broken down hotel and cafe after another and a river called Green. 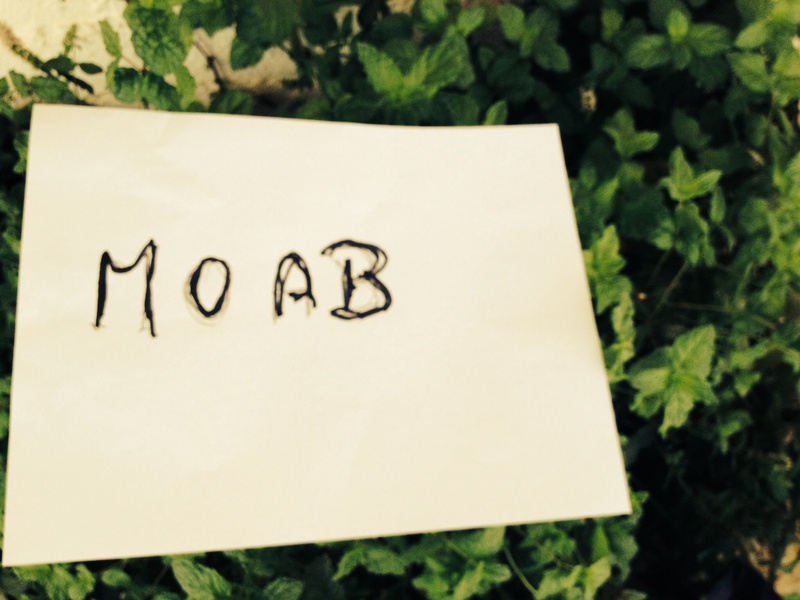 We made a pathetic sign “Moab” and I stuck out a thumb while Gino entered the one open diner and sweet talked Sylvia the Mexican chef to shut up shop and drive us where we wanted to go. We got very very lucky. m, and any time I asked if we might visit another rock he would say “if we have time.” It was ok, but kind of tiring and a bit boring after the first 3 shots at it. Yesterday’s simplicity however was made up this morning by Bud the Brilliant. He’d been eavesdropping as Gino and I checked in at the Adventure Inn; a place where people have sent snail mail letters thanking Jim and Chris, Bud’s good mates, for their kind hospitality. He collected me at the crack of dawn and taught me like the true beginner I am/was. Etiquette was very important (“if there’s just one thing I teach you today…share the rock, use your own anchor”) and I am now able to belay a bloke and thus be a useful buddy. I became a bit dizzy with the lingo but I’ve heard it all once now and the first time is surely the dizziest part. There was some to-ing and fro-ing…. It was really really scary at times. I mean, you know you’re not going to fall, but bloody hell, it was steep and sometimes I was holding on to nada, with my toe resting on a crack. They scale up from 5 here and I will later brag to anyone who cares to listen that I climbed 5.10. And then probably learn that it isn’t worth bragging about and shut my mouth again. But Bud did say that I am a natural. Charm’ll get you everywhere. He wouldn’t even let me pay for gas, only a burger for his lunch. A real gem, who takes people out just for the love of it. Gino kept on insisting on paying for my dinner too, I must look like a real bum. I am back on the train. Gino and I just spent another four hours at Green River for the freight companies own the train tracks and today, Sunday, is a good day for repairs. We just met Roma walking the streets, most of town at the Green River cafe, and the pastor at one of the three churches. We were an hour early for the service which, for some reason, we thought might be an interesting way to pass the time. Still sinners. What is remarkable is that Gino said a short while ago that I am teaching him about patience. Me? I am one of the least patient characters I have ever laid eyes on, but cheers Gino. I just didn’t want to get on the Greyhound. Impatient Gino heading off for the Greyhound. He’ll be back. He has been writing a script and scouting for a documentary he is making about food culture in the States, hooking up with some famous chef called Alice who began the famous Chez Parnasse in Berkeley. And he is now considering casting me in it and thinks I should be a comic actor. I have been chatty it is true, and I am in a good mood, but with a camera in my face capturing my every move I would go weird and shy and so I say no. Not that he is saying yes, and if one day he wanted to fly me to Roma for a casting, well, I’m sure I’d say alright. But no, I don’t think so. There really is nothing like an Aussie accent in Utah to inspire banter with strangers though. It is working so deliciously well it is no wonder I can’t leave the States, and it reminds me how completely in love I fell with the place during last year’s visit. In the UK you’re just another bloody Aussie but here I feel a teeny bit exotic again and what can I say, I love feeling just a teeny weeny bit exotic. I did let Gino in on how famous I am in Argentina after that, and my massive role as a Swedish lesbian in Bien de Familia; a mini series which was pretty dreary but made it to air the month before I left. I was meant to be the daughter of a Swiss banker, working for Medicines Sans Frontiers and saving children in Africa, but by the time I came in at episode 8 someone else in the cast had accidentally referred to me, Gudula, as Swedish instead of Swiss. Sueca is close to Suiza, it is true. I tried to argue with the continuity guy who rushed in to correct me after one of the takes (there was some improvisation to add to my awkwardness as the only foreigner and the only one who’d never acted) and his response was, and I quote, “no pasa nada. Es todo lo mismo.” Whatevs mate. It’s all the same, innit? It was a family drama about self medicating Argentine psychiatric mothers and badly investing Argentine fathers, and my debut into the lesbian scene involved one kiss and one hand on one thigh. Not a terribly steamy role. Reading the script I worried less about kissing chicks and more about the expectation that I laugh, cry and be terrified. Thank God for the director’s improvisational stance as I didn’t have to do or be any of those things….I was just good ole’ Swedish me. Crying I reckon I’d have been able to pull off, maybe, but fake laughter? Forgetaboutit. Incidentally, my marvellous French flatmate told me at the time of filming that the name Gudula in France is a synonym for a very butch, truck driving lesbian. Excellent. So now I am patient and I am running with that, just so you know. After Gino and I ate some steak and wandered down Main Street towards a bar called Woody’s (the town’s one other bar is Eddie McStiff’s) we passed an out of towner who’d spent his evenings that week showcasing his gigantic telescope and aiming it at the moon for all us fine punters passing by to have a squiz. Gino and I lingered long enough for him to swing it around to Saturn. Fantastic. We and this very late train are headed now to Glenwood Springs by the way, and in the next few days, instead of practicing my newfound patience, I intend to chase a strange boy to Chicago. He is possibly the oddest character I have ever wanted to kiss twice and I am going to the Windy City to find out more. Or to freak out at my careless and rash decision at which stage I will throw myself out of the United States of America and get myself south of the border where I am meant to be. Apple picking is definitely not happening though. And I am on stand by for changing Cuban Cubamera dates. It has been way too long between kisses and I am just tinkering with ideas of romance and affection. I miss it and I want it some more. Must have been that workshop I joined one morning at Burning Man titled “Open your heart chakra though movement meditation”, where I was invited to ooze green Saturnian rings through my heart, the playa and then of course the entire cosmos. 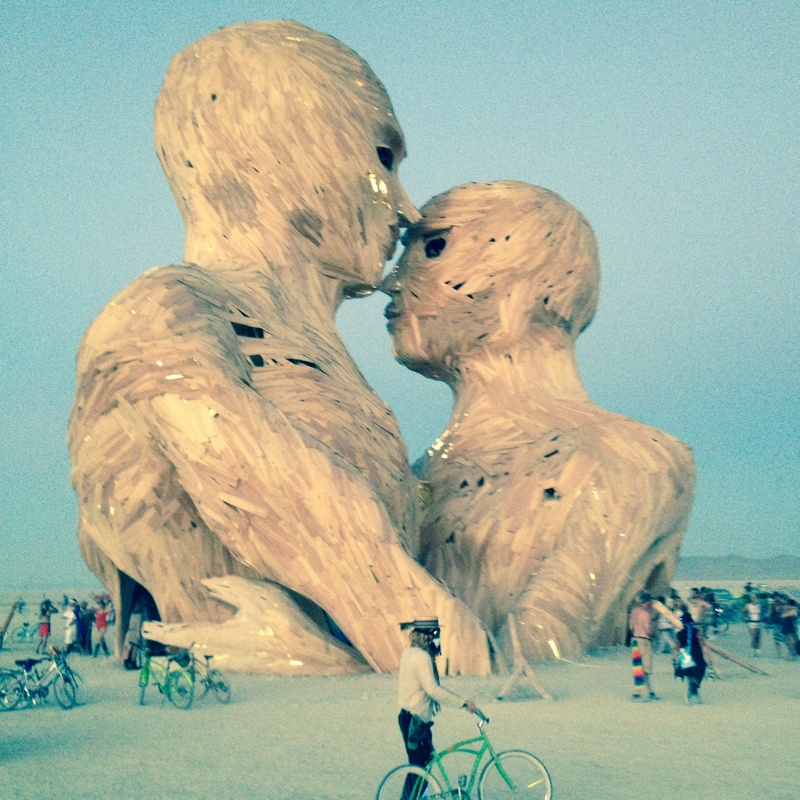 I kissed a couple of other boys at Black Rock City. Doctor Love was the best kisser (Aussie lad) who was hanging out with Hugs and Trouble. Mustang from Wisconsin sadly coughed up about his girlfriend the day after we kissed and of course there was the kissing booth. These strange names I speak of are Playa names. Like Strider and Polar Bear who I met from the Seattle Flight if you recall. Mine was given to me on day 2. I was wandering back from Embrace having attended a funeral service with my entire camp, Camp Anita. We each dressed in white and walked to the Temple to celebrate their friend from Camp Anita and one girl’s mother who had died earlier in the year. Indy (who later became Pirate), with whom I shared a campervan (RV) hadn’t yet crawled about inside Embrace so after the funeral we ventured over. We split up and when we eventually found each other she was outside about to kiss some fellow. I left them to it and as I wandered away I asked a Frenchman cycling past, Lolo, for directions to 630 and Isfahan. When I offered just Kirsty and no Playa Name he said “from now on you are The Baroness.” “The Baroness! !” He repeated it like it was an order and cycled on his way. I mean, I kind of liked it, but as I am not actually a baroness it did seem a little on the pretentious side. And the following day I met Tricky who, detecting something was up as I hesitated to introduce myself, helped me workshop it a little. He insisted that I introduce myself as “the” baroness, and not simply baroness. And so I did. And to think that Lolo didn’t even know that I had long white leather gloves and a nasty cheap but perfect white furry coat in my wardrobe. The gloves and the backpack are now long gone and Gino commented on what a light traveller I am. You can only imagine how delighted I was to hear those words. I’ll have to start another letter later with more about the “burn” as this one is surely already too long. I hope you are wonderfully well. I am terrific and in a bit of a rush. Got an overnight train to catch and the Pneumatic Diner in downtown Reno to visit before I board. There aren’t so many apples awaiting me in Hermosillo (bad drought) and I have developed a desire to climb rocks. So I just bought a one way train ticket to Utah having been told by some young base jumpers from New Orleans about Moab, Utah. I seem to be oriented well for exploring part of this beautiful country, with its friendly people and its very handsome and flirtatious men, and it appears I am in no rush to jump down into Mexico so to Moab I go. Give me two weeks of yankee tucker though and I’ll no doubt be sprinting for the border. 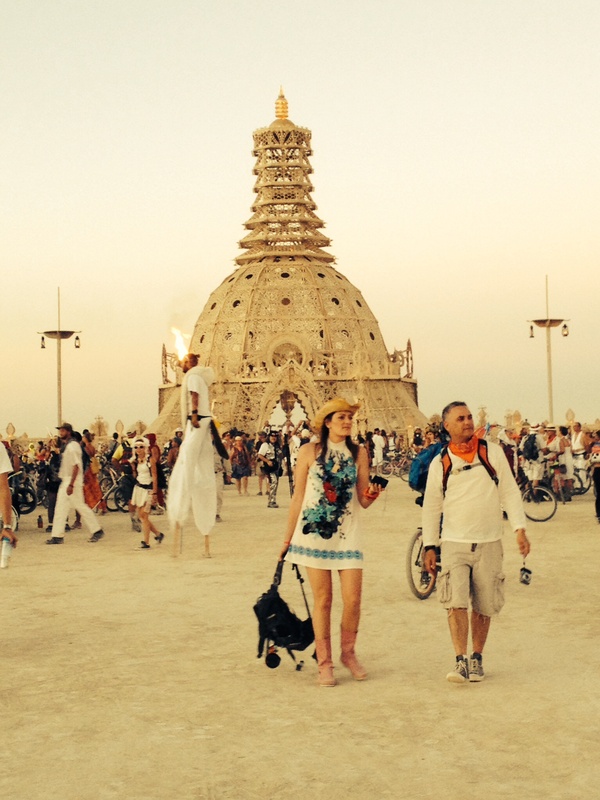 I have two posts ready to go pre Black Rock City which I shall send in a bit and will catch you up on the festival in time. It was magnificent. Burning Man takes place in Black Rock City, by the way, if I have confused you. But for now, know that I am alive and well and happy and nervous again, for after all my new mates, I am on my own once more and it always throws me into a mild spin of semi-excited, semi terrified mode. Utah? Who’d have thunk it. And Colorado is just next door. Anyone reading this with any mates in the area please do hook a sister up.